For decades I've started my day with a bagel and cream cheese topped with chili salt Living in Florida and being active, I need the extra salt and a little spice to start the day. Fell in love with chili peppers hobenaro hot salt on vacation to the OBX and these guys carry it!!! I have been a fan of this salt for years and will continue to be. Excellent on anything you'd put salt on and the flavor just jumps! My go to salt for buttered corn on the cob. It's delicious. Love the Habanero Hot Salt. Put it on everything! This salt takes food to another level of taste with just the right amount of heat and saltiness. So good I have it every morning! I've been using so much less salt on most food that my doctor told me to eat more. This is the perfect solution to spice up my morning bagel! Always gives a little more tang to dishes, everything from a bagel and cream cheese to mixed with maple syrup on a pork loin. There's nothing like a good bagel and cream cheese with a sprinkling of Chili Pepper for breakfast. I also use it for seasoning salads, meat, fish and chicken - can be used on any and every thing!!! I have a low sodium level and it helps keep me healthy. And the restaurant that invented is (on the OBX) is one of my all-time favorites. Salt + Heat = tasty goodness! We have to have this salt at all times! Love it on pasta! I even have a bottle at work. Can't live without it! This is one of my FAVORITE seasonings EVER!! If you are thinking about ordering it, do it! My only complaint is the change of packaging from the beautiful glass bottle to the now cheap, plastic bottle with ugly/different logo. Good thing I saved the other one to refill that container. Otherwise, always thrilled with our hot salt! I've been a fan of Chilli Peppers Hot Salt for years. It's wonderful on raw or cooked vegetables, and in soups. I imagine it tastes great on meats as well, but I'm a vegetarian. There's nothing like a little spice to brighten your day - starting with a bagel and cream cheese with habanero salt on top and ending with a marinated steak with a bit of the same. We have used this salt since we lived on the Outer Banks of NC where it is made .... now we have to order it instead of walking to the end of our street since we live in FL. All salt, no heat. Salt grains huge, worthless on popcorn. Wish Morton's Hot Salt was still available. you do not explain your rating is #1 the best or is #5 the best. I will assume that #1 is the best so I will go with #1. I'm glad you had the seasoning in stock. The restaurant that developed it has been out of it for over a year. Use THIS salt on your rim for a margarita or a michelada! Absolutely amazing! For a special treat, take a sip and then kiss someone! They'll thank you! Best hot salt, use on and in just about everything off! 5 meaning great. We have purchased this in the past and ran out. It is also a gift this year for the daughter that got it for us and then she ran out. Keep up the good work. 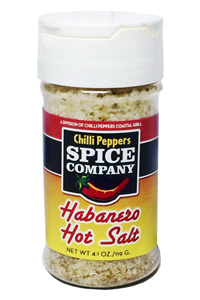 This Chilli Pepper Hot Salt is addictive! I use it on everything! Try it, and you will too!